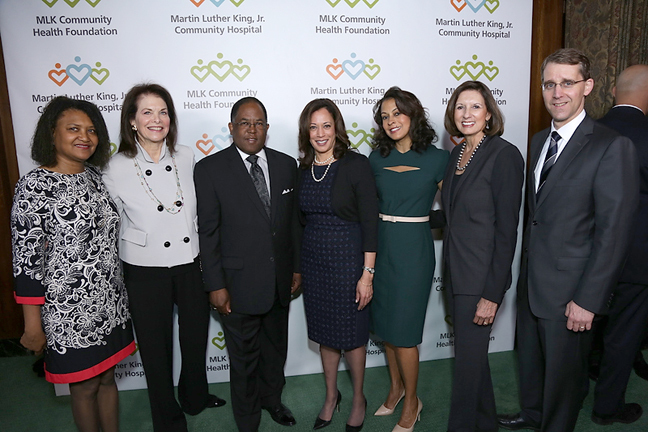 The MLK Community Health Foundation held its kick-off luncheon on Wednesday, January 15, 2014 in the Grand Hall at the Dorothy Chandler Pavilion. Over 600 guests attended the celebration of the new Martin Luther King Jr., (MLK) Community Hospital, slated to open in 2015. The event recognized donors and partners and honorees included Venus and Serena Williams, Game Changer Award (acceptance by pre-taped video); Teaching Gardens, Founder, Kelly Chapman Meyer and partners American Heart Association and The California Endowment, Community Engage­ment Award; and Dr. Michelle Bholat, MD, MPH, with the Yancey Award. The MLK, Jr. Community Hospital is a private non-profit, safety-net hospital that will deliver high quality, collaborative care to South Los Angeles and surrounding communities in partnership with the County of Los Angeles, University of California and other community providers. It will be licensed for 131 beds and will provide general acute care and feature an emergency department, a critical care unit, labor and delivery capabilities and include radiology and other ancillary services. The new hospital will offer a level of service that ensures a high quality, high tech and high touch health care experience for patients and their families regardless of citizenship status or ability to pay. • Reaching, Teaching, Learning: A patient and community Learning Center that will be an integrated part of the Hospital’s teaching, training and outreach programs. • Partnering for Primary Care: Support for partnership work between the Hospital and community clinics to attract physicians and allied healthcare professionals to practice in the South Los Angeles clinic, providing adult and family wellness care. • Innovations Hub: A campaign to secure technology partners in delivering quality care to Hospital patients through new and innovative technology approaches. • Art Fund: An initiative to visually transform the Hospital into a healing, comforting environment.